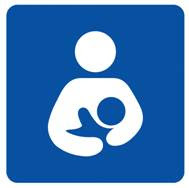 WhereToFindCare.com Blog: What to eat when Breastfeeding? 1. Calcium, iron, vitamins and folic acid are important in pregnancy and during the time of breastfeeding. 2. Limit caffeine to 2 or less servings a day. Be careful to monitor as caffeine is not only in pop and coffee but some food items such as chocolate. 3. Drink water - 8 to 10 glasses a day. You can even drink it while breastfeeding your baby, just keep a water bottle nearby. 4. Eat healthy snacks such as bagels, fruit smoothies, tuna, and raw vegetables.